Euro ’80 (or Europa ’80 as it was generally known at the time) was the first time the European Championship finals resembled a proper tournament, with the eight remaining sides split into two groups of four. On paper this should have been good news, allowing fans to enjoy a feast of football and Panini issued a sticker collection for the tournament. But the decision to have the group winners progressing to the final rather than the top two teams playing in the semi-finals backfired, as sides found themselves out of the running early. And it seemed to greatly impede the quality of football, with negative tactics frequently seen. Because of the format England and Spain played their final group game knowing the best they could hope for was to make the third place play-off, a fairly limited incentive. For the only time the last round of group matches in the European Championship were not played simultaneously, which meant the match between West Germany and Greece was a dead rubber (it would not have been if held at the same time as Czechoslovakia against the Netherlands). With just 11 days separating the opening game and final, this was a case of a major tournament looking too rushed through rather than the more usual complaint of feeling too long and bloated. The European Championship was not alone in trying out the format for the group winner to go through to the final in this period, with the second group stages of the 1974 and 1978 World Cup also seeing this process in place. But that was for sides who had already played three matches in the tournament, whereas this one saw teams facing potential elimination effectively from the word go. It is probably no coincidence that the 1976 final stages in Yugoslavia (consisting of just the semi-finals, third place play-off and final) were far more captivating, as would the Euro ’84 finals be after the semi-finals were reintroduced. 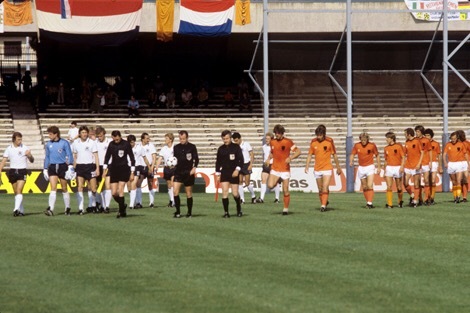 Plenty of space in the stadium for one of the competition’s few good games – West Germany against the Netherlands. Not helped by the competition format, entertainment was limited and goals were at a premium for much of the defensive-minded finals. England’s group was particularly low scoring and tight, with no side winning more than one game and hosts Italy’s record consisting of one goal for and none against! Things proved slightly better in the other group where West Germany beat the Netherlands 3-2 in the standout tie. But despite the high-scoring nature of the match it would not – in the UK at least – in later years feature much when revisiting classic meetings of the rival sides. It was a tournament largely bereft of flair sides and for the Dutch – who could quite feasibly have won all three previous major tournaments from 1974 to 1978 but ended up trophy-less – this competition proved a bridge too far and an anti-climatic end of an era. They wouldn’t grace a major tournament again until Euro ’88. 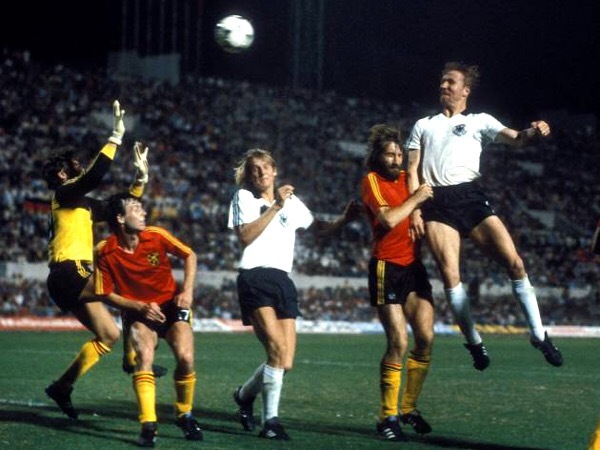 Horst Hrubesch gives Euro ’80 a more dramatic climax than it probably warranted. Generally speaking, the matches at Euro ’80 blended into one another with nothing to truly savour like France beating Portugal 3-2 in 1984 or Spain’s incredible 4-3 victory over Yugoslavia in 2000 that left the continent’s football followers on the edge of their seats. It says a lot that probably the most exciting match British TV viewers saw in June 1980 was Scotland’s 5-4 win over England in a schoolboy international at Wembley. Sadly the lasting image of the 1980 finals is not of amazing football or great goals, but of the violence that broke out on the terraces during England’s opening match against Belgium in Turin. The situation turned ugly enough for the police to use tear gas and the match had to be halted for several minutes before normality was restored, as goalkeeper Ray Clemence found his vision affected by what had been sprayed. BBC co-commentator Bobby Charlton said they were “some of the ugliest scenes” he had ever seen. The English nation’s reputation was tarnished by such a public show of disorder inside the stadium and set the trend for the ‘English disease’ to grow in the ensuing years. The matter made front page headlines and was far more discussed than the match itself, with the normally mild-mannered England manager Ron Greenwood saying “I wish they could all be put in a boat and dropped in the ocean”. A rare sight of busy terraces at the 1980 European Championship as England face hosts Italy. Italy was selected ahead of nations including England to host the finals, just 12 years after it had previously done so. Such a football-loving nation would have surely been expected to flock to the matches and savour this feast of football. But a distinctive element of this tournament was the strikingly low crowds for most matches, the neutrals not willing to pay up to attend them. 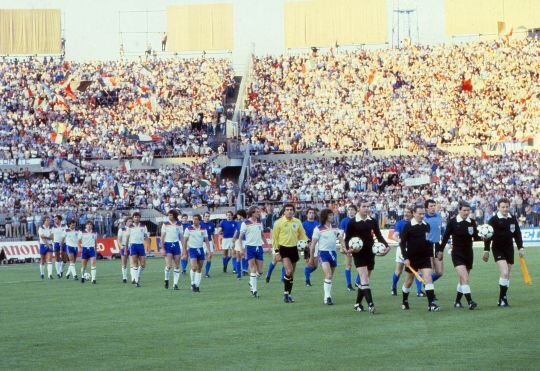 The tone was set when the opening match – a repeat of the 1976 final between Czechoslovakia and West Germany – was attended by a mere 11,059 in the Stadio Olimpico in Rome. The Czechs would then be watched by less than 5,000 when they met first-time qualifiers Greece in the same stadium. Although the attendance for the final of 47,864 was respectable, it still fell some way short of the Stadio Olimpico’s capacity. England played in front of the biggest crowd of the finals when 59,646 saw them take on Italy in Turin, but their first match in the same stadium against Belgium pulled in only 15,186 and their last game against Spain was attended by just 14,440. Sadly, the stay-always probably had the right idea and TV viewing figures were also reportedly low. The tournament was one big turn-off. Greenwood’s England were in their first tournament finals for a decade, but they had qualified with conviction and could boast a high number of players who had won the European Cup in recent years with Liverpool and Nottingham Forest. They were tipped as a potential winner of the competition, but would come up short. A superb chipped goal by Ray Wilkins in their opening match against Belgium proved the one real highlight, as they were held to a draw and then lost 1-0 to the hosts. That meant it was impossible for them to win the competition. Although they beat Spain 2-1 in their final group game, a draw between Italy and Belgium meant England failed to make it into the third place play-off and returned home. Greenwood had seemed keen for as many players as possible to get match time and his often-criticised rotation policy for goalkeepers Ray Clemence and Peter Shilton had again been in operation. We will look back more closely at how they fared in this tournament at some point before next year’s Euro finals. The competition had not been good for England and not notoriously bad like Euro ’88. It was just underwhelming and forgettable, save for the conduct of the hooligans. It had probably been a bit of a reality check for England and they would soon face a struggle to qualify for the 1982 World Cup. Euro ’80 had clearly served very few positives for the nation and the continent in general. Some of the criticisms of Euro ’80 could also be levelled at Italia ’90, particularly concerning negative tactics and a lack of goals. And yet a combination of Nessun Dorma, England’s run to the semi-finals and some iconic images mean it is held up by many in England as a tournament to cherish. By the time it took place, few were looking back at what had happened in the same country a decade earlier.